If you're looking for a central location Villa Barquetta is a great choice. Ideal for both small and larger groups, this impressive 5 bedroom house is only 15 minutes on foot from the beautiful Playa Grande Beach. It runs parallel to Puerto del Carmen Strip, lined with a never-ending choice of shops, restaurants and nightlife. The villa is bright and spacious and has a large pool terrace. Air conditioning/heating in the lounge and bedrooms, pool heating and WiFi are included. Spacious inside and out, with a private swimming pool and within walking distance to the centre of Puerto del Carmen. Bliss! Outside there is a private swimming pool surrounded by ample terrace space - ideal for relaxing with a good book and a cool drink. The brick BBQ is to one side of the garden, which has a preparation area and a sink, comple mented by the table and chairs which are great for alfresco dining. The garden and terrace are fully enclosed with high walls and hedging for a good deal of privacy. There is a private parking space for your car should you choose to hire one. A pathway lined with exotic palms leads to the front door. The lounge has an unusual semi-circular shape, comfortable seating and windows overlooking the front of the villa. On the other side of the villa there is a dining area and well-equipped kitchen which has patio doors onto the pool terrace. On the ground floor you will have 2 twin bedrooms and a separate bathroom. On the first floor there is a double bedroom with an en suite shower room, a second double bedroom and a twin bedroom, all three with their own private balcony. There is a separate shower room on this floor too. All 5 bedrooms have ample space and are tastefully decorated. Villa Barquetta is within walking distance of shops, bars, restaurants and Playa Grande Beach in the popular resort of Puerto del Carmen. This villa is an ideal choice if you don't want to drive on your holiday. What's more, the old town and harbour, as well as the fashionable Puerto Calero Marina, which is famous for its designer shops and chic yachts, are within 10 minutes taxi ride . There are shops for your daily essentials 600 yards away and for more shopping opportunities head to the main Strip. Here you can find places selling everything from designer clothes, shoes and sportswear to gifts, jewellery and beauty salons. There is also a market in the harbour and old town area every Friday selling many local goodies from and around Lanzarote. The villa is just a short walk away from the bars and restaurants with a much bigger choice on the main Strip. There is every type of restaurant you could possibly want, from Spanish tapas and tasty Italian to spicy curries and many Asian style eateries. If you're a seafood fan then the old town and harbour area is the place to be! There are restaurants selling fresh seafood and typical tapas bars where you can sample the local dishes, cheeses and wines. The main beach, Playa Grande, is only ¾ mile away and has golden sand, crystal-clear waters, as well as sunbed and parasol hire. Alternatively, Playa Chica Beach is located in the old town and is perfect for snorkelling and scuba diving. Rancho Texas Park is a must on a family holiday. During the day there is an animal park with birds and animals from all over the world, canoes, play areas and the not to be missed parrot and falconry shows. At night it turns into a cowboy and Indian themed night with entertainment, a BBQ, disco, line dancing and games. An excursion kiosk is available in the harbour should you wish to venture further afield to explore this beautiful island. Timanfaya National Park is probably the most popular place in Lanzarote. You can take the journey through the luna route passing some of the largest craters and the valley of tranquillity to fully appreciate the natural energy that has shaped the island. Jameos Del Aqua has an interesting gallery of connecting caves found in the North at the base of Monte de la Corona Volcano which erupted more than 3,000 years ago and was artistically developed by Cesar Manrique for public viewing. There is an 18-hole golf course a 10 minute drive away from Puerto del Carmen. A more established course is also available in Costa Teguise located on the East Coast or there's a pitch and putt course in the Hesperia Hotel in Playa Blanca. A great way to familiarise yourself with Puerto del Carmen is to hire a bike and make the most of the purpose-built cycle lanes. Lanzarote is also a great destination for activities such as hiking, wind surfing, surfing, and water sports. Villa Barquetta is not available to book for season as it is sold out. Take a look here at the Lanzarote villas that are currently on sale. Brill holiday, all the family enjoyed themselves - coming back soon! Whole experience was excellent, with absolutely no complaints. Really excellent holiday. The best villa we ever used! The villa was a good size for our group of 5 Adults, 3 children and 1 infant. Nicely set out and adequately furnished, nice sized kitchen/dining/living room area. Bedrooms were good sized and the beds very comfortable. The back terrace/sunbed area where the pool table and table tennis were, got the sun pretty much all day. A nice villa in an excellent, peaceful location, a few minutes walk to supermarket/shopping area, 10 minutes walk to the old town harbour one way, 10 minutes walk to the beach/new town the other way. 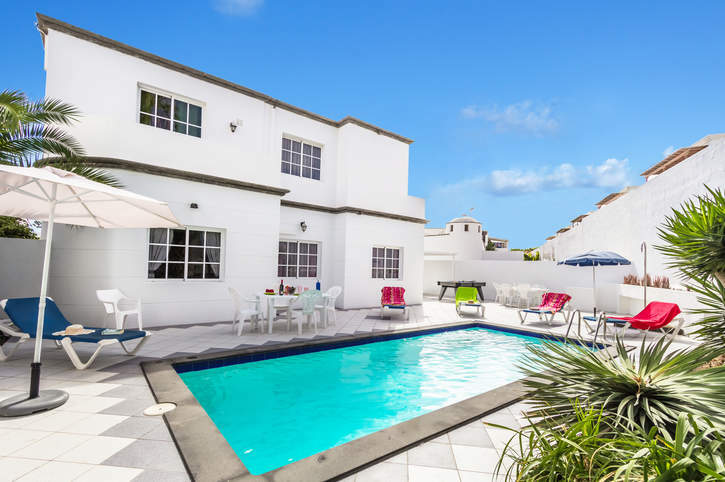 We didn't hire a car as Villa situated approximately 15/20 minutes away from Airport and everything in Puerto Del Carmen is within walking distance. Exceptionally well equipped and very clean. Location perfect. Plenty of shops in walking distance. Excellent local Rep service. CD not working, we emailed the local Villa Plus office and a new CD player supplied within hours. We booked our own flights etc; we just booked the Villa last minute with Villa Plus, it couldn't have been easier and there were no hidden extras. The Villa alone exceeded all expectations, everything worked as it should, everything we needed was available, the pool was absolutely brilliant, the system that Villa Plus use is great, we had no problems with access to the Villa, it was home from home the minute we arrived, we had a fantastic holiday, we are already looking at booking for half-term and it is going to be Villa Plus without a doubt, I like value for my money and boy did I get it. Top marks Villa Plus and many thanks to you all from my family and me. Lovely, clean & spacious villa. Villa Barquetta was clean and spacious, conveniently located for the shops, beach, strip and the port. We loved it!